JFH News: The Rocket Summer Returns to the Road Announces "Returning West Tour"
"Playing live is like oxygen to me so the break has been tough. I can't wait for this," says Bryce Avary of THE ROCKET SUMMER. Luckily, his break from touring is nearly over with the announcement of a North American West Coast tour this Fall which begins as soon as he returns to the U.S. after closing one of the stages at London's Vans Warped Tour. 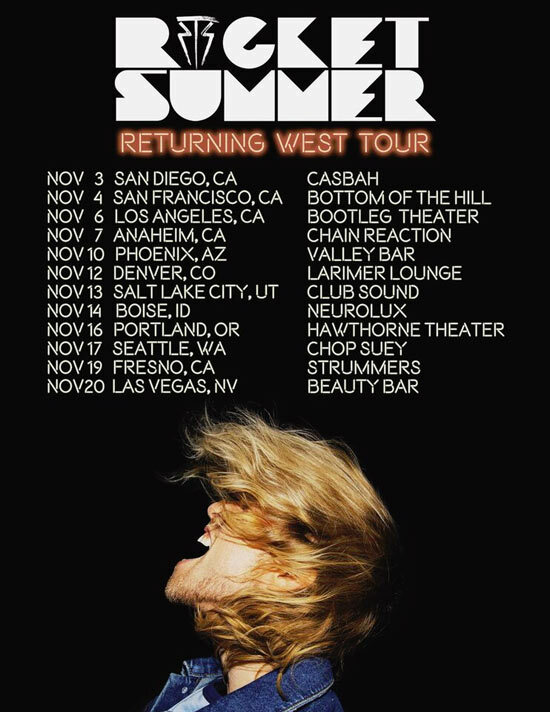 Kicking off on November 3 rd at Casbah in San Diego, CA, The Rocket Summer will be returning to the road to prepare for the release of a new album set for early 2016. He will be bringing TEAM as support who he describes as "good guys from Dallas Fort Worth, my home town." Though Bryce has taken a break from the tour bus, he hasn't been away from creating music. "It's certainly been a long break from the road but literally just about the only thing I've been doing is making music constantly," he explains about his year and a half absence from touring. "I wrote about five album's worth of material for this and recorded just about every day for a year. I just couldn't stop." He described his new album (which was announced last week with his pre-order) as "something special that I hadn't felt on previous albums. It's one of the best albums I think I've made… for me at least. Honestly, I didn't want to make a sappy record… I wanted to make a record that sounded like doors being kicked down and bombs going off." While he'll surely be playing crowd favorites and his favorite songs from his catalog, such as "Walls", "Do You Feel" and "So Much Love", he'll also be including some surprises as well. "We will be playing a few new songs from the upcoming album for sure, giving tastes of what's to come," he says excitedly. "It won't be out yet so we can't overdo it, which is hard because naturally I can't wait to play the new album live. There's also nothing quite like hearing a room of people singing along with one collective voice to songs they're already a part of. That moment of unity is uncanny and spiritual in a way and I'm really looking forward to that. So this tour is more of a celebration that the family is back together as we lead into and set up the new season of the new album. It's been too long." "In a way, I pretty much didn't come out for a year," Bryce explains about his absence from the public eye. "My only mission was to be creative as possible and to push myself further than ever. I didn't think I needed to but I basically fell in love with music all over again like I had when I was first learning to play. For me, this album sounds like that." For more info on The Rocket Summer visit the JFH Artists Database.